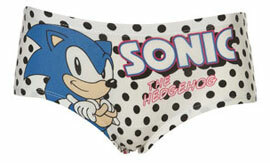 It goes under your clothes and comes in several different styles. Everyone wears it, but no one much thinks of it. It's usually pretty boring. It's clothing no one usually sees. 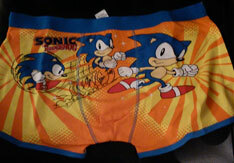 But that doesn't mean that you can't have fun collecting Sonic themed underwear! 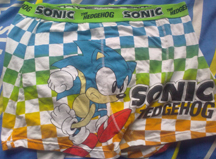 Boxers & briefs are here, plus styles in between. 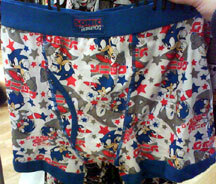 Most underwear here is modern, & most comes in a decent range of sizes that are likely to fit you. Any prices & locations/times to buy are noted with the entry where available. 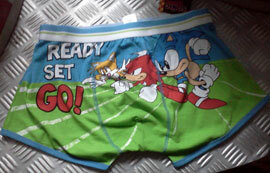 This underwear has a fun theme of 'racing'. 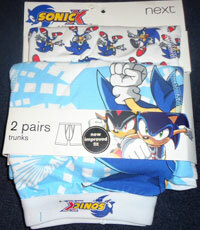 They've arranged the classic stock arts for Tails, Knuckles & Sonic to make it look like they're in a race. Cartoony letters say "Ready Set Go!" on the other side. It has a very basic green ground/blue sky 'background' for the scene. It's a fun & different design to collect.